Originally called the Grammy Award for Best Rock Vocal Performance, Female, the award was first presented to Donna Summer in 1980. Beginning with the 1995 ceremony, the name of the award was changed to Best Female Rock Vocal Performance. However, in 1988, 1992, 1994, and since 2005, this category was combined with the Grammy Award for Best Male Rock Vocal Performance and presented in a genderless category known as Best Rock Vocal Performance, Solo. 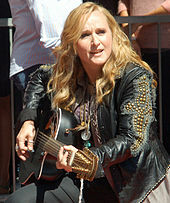 The solo category was later renamed to Best Solo Rock Vocal Performance beginning in 2005. This fusion has been criticized, especially when female performers are not nominated under the solo category. The Academy has cited a lack of eligible recordings in the female rock category as the reason for the mergers. While the award has not been presented since the category merge in 2005, an official confirmation of its retirement has not been announced. Pat Benatar "Shadows of the Night"
Tina Turner "One of the Living"
Melissa Etheridge "Ain't It Heavy"
Melissa Etheridge "Come to My Window"
Sheryl Crow "Sweet Child o' Mine"
Sheryl Crow "There Goes the Neighborhood"
Lucinda Williams "Get Right With God"
^ Rodman, Sarah (February 8, 2009). "All my rocking ladies, don't bother putting your hands up". The Boston Globe. The New York Times Company. Retrieved April 26, 2010. ^ a b Hunt, Dennis (January 15, 1988). "U2, Jackson Top Grammy Nominees: Simon, Winwood Seek Reprise of '87 Wins". Los Angeles Times. Tribune Company. p. 3. Retrieved April 26, 2010. ^ a b c d e f g "Grammy Awards: Best Rock Vocal Performance – Female". Rock on the Net. Retrieved May 25, 2010. ^ Hilburn, Robert (February 23, 1985). "Here's one critic's picks for Grammys". Ottawa Citizen. Canwest. Retrieved May 27, 2010. ^ de Atley, Richard (January 10, 1986). "Dire Straits, Tina Turner, Sting lead performer nominations". Times-News. The New York Times Company. Retrieved June 4, 2010. ^ "Here's list of nominees from all 77 categories". Deseret News. Salt Lake City, Utah: Deseret News Publishing Company. January 12, 1990. Retrieved June 4, 2010. ^ "Nominees announced for Grammy awards". TimesDaily. Tennessee Valley Printing. January 8, 1992. Retrieved April 26, 2010. ^ "Grammy nominations". The Baltimore Sun. Baltimore, Maryland: Tribune Company. February 21, 1993. p. 1. Retrieved September 4, 2014. ^ Campbell, Mary (January 7, 1994). "Sting, Joel top Grammy nominations". Star-News. The New York Times Company. Retrieved April 26, 2010. ^ "1999 Grammy Nominations". Reading Eagle. Reading Eagle Company. January 6, 1999. Retrieved June 4, 2010. ^ "42nd Annual Grammy Awards nominations". CNN. January 4, 2000. Archived from the original on July 22, 2012. Retrieved June 4, 2010. ^ "Complete List Of Grammy Nominees". CBS News. January 4, 2002. Retrieved June 4, 2010. ^ "They're All Contenders". The New York Times. The New York Times Company. December 5, 2003. Retrieved June 4, 2010.